Passengers board a bus in the magnificent Maroon Creek Valley. Ridership on the Maroon Bells line was up nearly 13 percent in summer 2018 over the prior year. If all goes according to plan, electric RFTA buses should be plying routes in the city and upper Roaring Fork Valley by the fall offseason, an official said last week. 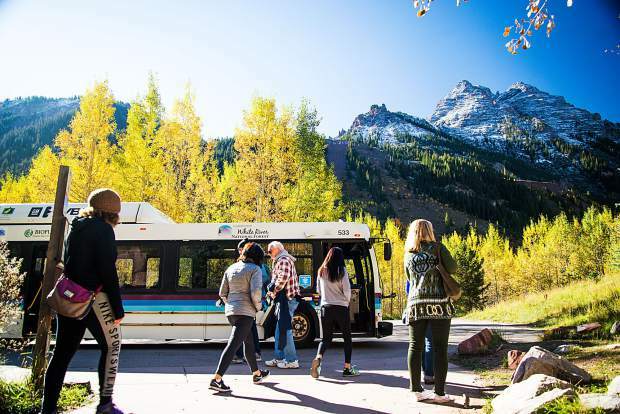 The eight buses are scheduled to be delivered in August and will kick off a Roaring Fork Transportation Authority pilot program that’s been in the works for more than three years and includes participation by Aspen, Pitkin County and Snowmass Village. “Oh, it’s really exciting,” said Pitkin County Commissioner George Newman, who also is a member of the RFTA board. “Mass-transit agencies are really going toward electric buses nationwide. The electric bus project began as a discussion between RFTA and the city of Aspen around the beginning of 2016, Blankenship has said. The latest incremental step occurred Wednesday, when Pitkin County commissioners approved two easements that clear the way for electric charging stations to be installed at RFTA’s Aspen facility. Current budget estimates put the project’s cost at about $8.9 million, with the eight buses — manufactured by a company called New Flyer — costing about $1 million each, according to budget figures Blankenship provided Thursday. The rest of the money will go toward chargers, installation of charging station infrastructure and warranty costs. Approximately $5.3 million of the total is coming from state transportation grants and another $500,000 from the Elected Officials Transportation Committee, which includes elected officials from Aspen, Pitkin County and Snowmass Village. The rest will come from RFTA and the city of Aspen, according to Blankenship. “We’re excited about it,” Blankenship said. The impact of the electric buses will be felt by most RFTA departments, he said. Drivers, maintenance personnel, facilities managers and information technology specialists all must learn new techniques and technologies to be able to deal with the buses, Blankenship said. Once the buses are delivered in August, the various departments must begin hands-on training before they are deployed. Then, once the buses begin service, the real training will begin, Blankenship said. The first routes for the electric buses will likely be within the city and then shorter, upper-valley routes once charging schedules and lengths are worked out, he said. They will probably not be used for leaf-peeping Maroon Bells routes this fall, though that is a goal to help reduce impacts in the sensitive area. Later on, once charging times are better known, plans call for on-board chargers, top-off charging stations at other locations and possibly the use of wind and solar energy to make the buses zero-impact, Blankenship said. “With 400 buses in and out of Aspen each day, hopefully this will reduce some of the nose impacts we have,” he said. The more expensive electric buses — new diesel models cost about half the price — should pay off in the end through less maintenance, less fuel and fewer impacts on the environment, Blankenship said. The goal is for RFTA’s fleet to be one-third electric buses within 20 years, Newman said. Electric buses have so far been successful in Park City, Utah and in Zion National Park, he said, which should make them ideal for many RFTA routes in the future, including the Maroon Bells, Newman said.